Attention DeepCapture fans in the New York and New Jersey area: our own Patrick Byrne will be speaking at Rutgers University on Monday, February 22, 2016 at Hageman Hall, New Brunswick Theological Seminary, at 4:30pm (EST). 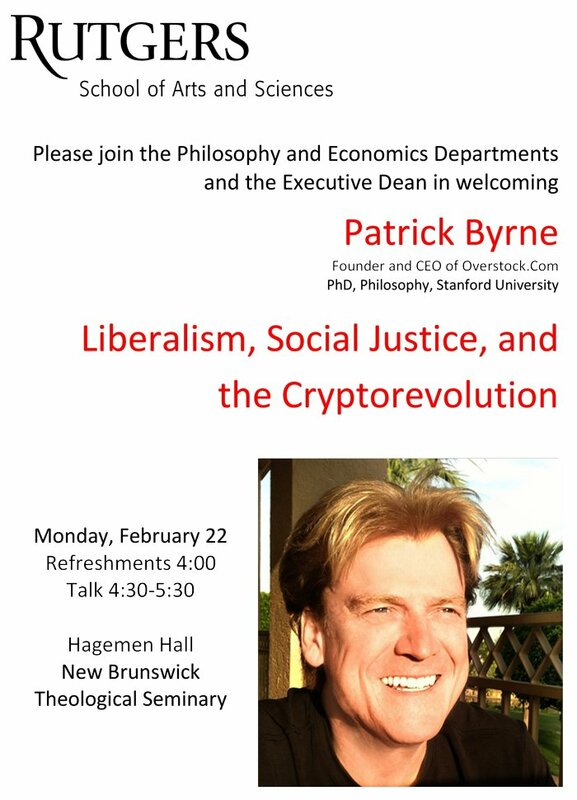 The subject will be the philosophical underpinnings of the cryptocurrency movement and how it relates to liberalism and social justice. The flaws in the current Wall Street settlement system, and how they can be remedied by blockchain technology, will be included in the discourse. I’ve been present for pieces of what’s going to be presented, and it’s always a fascinating time. Hearing all the pieces brought together is something not to be missed.